Still Pitching is a coming-of-age story about growing up in New York in the 1950s. It details how a passion for baseball—a passion fueled by New York’s “golden age of baseball,” during which one of New York’s three baseball teams made it to the World Series for ten consecutive years—transformed the author from an introverted outsider into a popular high school pitcher. Readers will cringe at schoolyard slights, root for Mike to figure things out, rejoice in his triumphs, and above all, remember how confusing and exciting life is on the route to adulthood. Baseball makes everything possible. Steinberg’s love of the game fuels his first success as a writer and then teaches him about discipline, persistence, and hard work. As if by accident, Steinberg learns exactly the skills he needs to become a confident adult and subsequently learns to follow his passion to become a writer. Michael Steinberg is New York native, has taught writing and creative writing for over twenty-five years at universities, has directed national writing workshops and conferences, and has been a contest judge for the Annie Dillard Award in Creative Nonfiction. He is the founding editor of Fourth Genre: Explorations in Nonfiction, an award-winning journal of creative nonfiction, as well as the editor of Peninsula: Essays and Memoirs from Michigan. 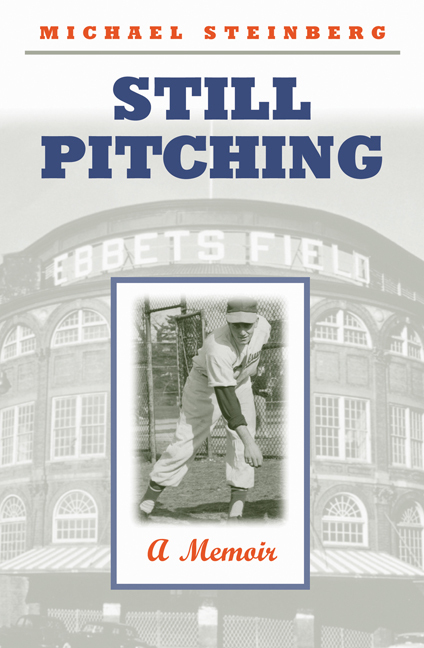 Steinberg's own essays and memoirs have won several national awards: A FOREWORD MAGAZINE 2003 Gold Medal for his memoir, STILL PITCHING; two pieces have been cited as Notable Essays in Best American Essays (1995 and 1999), and one in Best American Sports Writing (1995). Four others have been nominated for a Pushcart Prize. Steinberg has written reviews for The New York Times Sunday Book Review, as well as many feature magazine articles for national and regional magazines. From 1974-1976, he wrote a bimonthly column for the Detroit Free Press Magazine.